Word automatically adds a break at the end of each page. 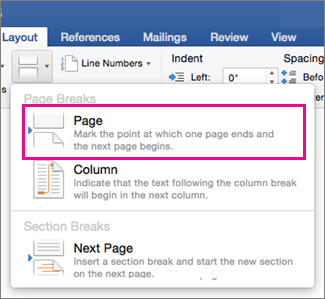 You can also insert a manual page break anytime you want to start a new page in your document. Click in the document where you want to insert a page break. Click Layout > Breaks > Page. Although you can't remove the page breaks that Word automatically inserts, you can remove manual page breaks from your document. On the Home tab, click Show all nonprinting characters . Click to select the page break you want to remove. On the Layout tab, under Page Setup, click Break, and then click Page. If nonprinting characters are not displayed, on the Standard toolbar, click Show all nonprinting characters . Select the page break that you want to remove, and then press DELETE.